Drake released his fourth album Views on April 29, 2016. Like most Drake content, the album performed remarkably well—it’s spent more than 100 consecutive weeks on the Billboard 200. 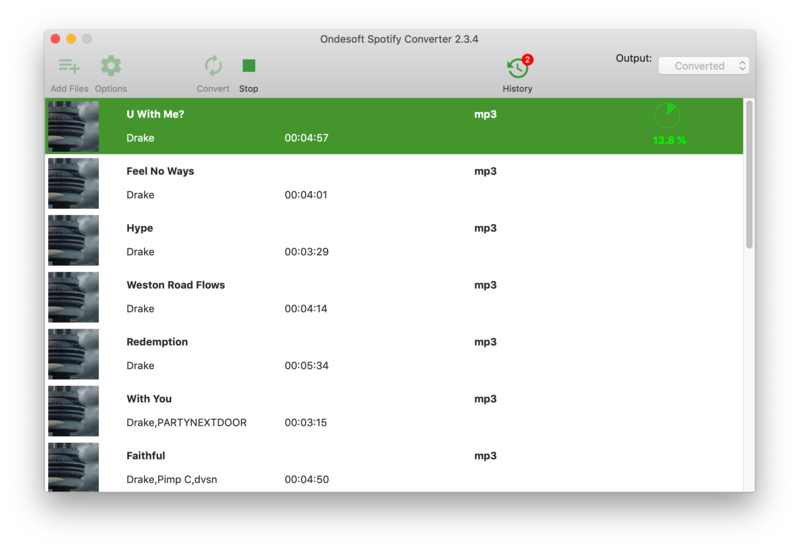 Here you will learn how to download Drake’s Views from Spotify to MP3, and you can save Drake’s any other songs or albums to your Mac/PC in the same way. It is well known that all of Spotify music are protected by DRM, even though premium users can not download Spotify songs to MP3 format. It is really a bad news for those who want to enjoy Drake’s songs on more devices. 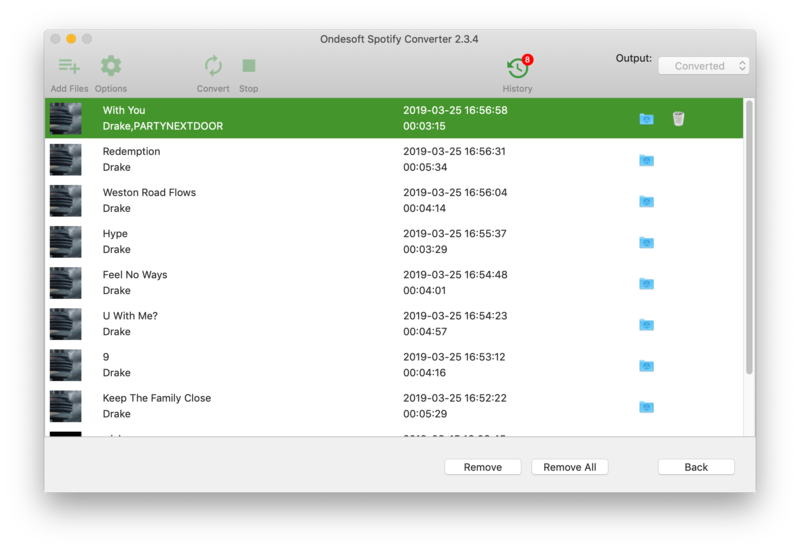 Fortunately, Ondesoft Spotify Converter is an all-in-one Spotify music converting tool, and it is recommended by most users who need to convert Spotify music to MP3. It is designed with advanced recording technology so that it supports to perfectly convert Spotify music to MP3, M4A, WAV and FLAC with 100% lossless quality preserved. 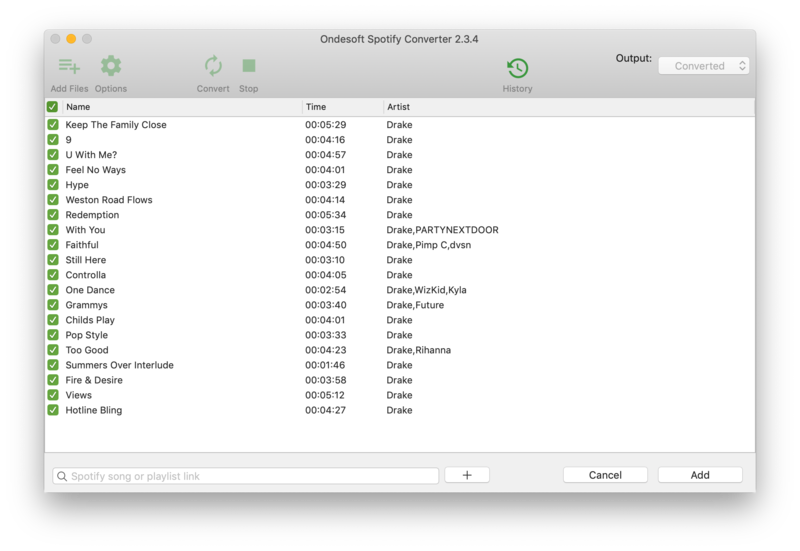 The following is a detailed tutorial on how to download Drake’s Views from Spotify to MP3 with Ondesoft Spotify Converter. How to export Spotify playlist to MP3 with Ondesoft Spotify Converter? 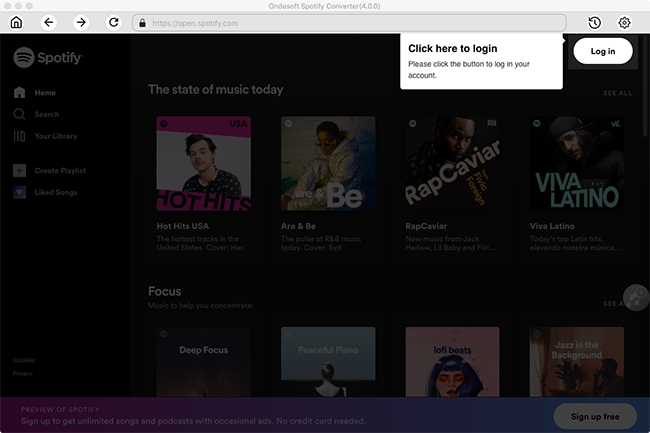 Please make sure that you have downloaded and installed the latest Spotify on your Mac/PC, then download and install Ondesoft Spotify Converter. 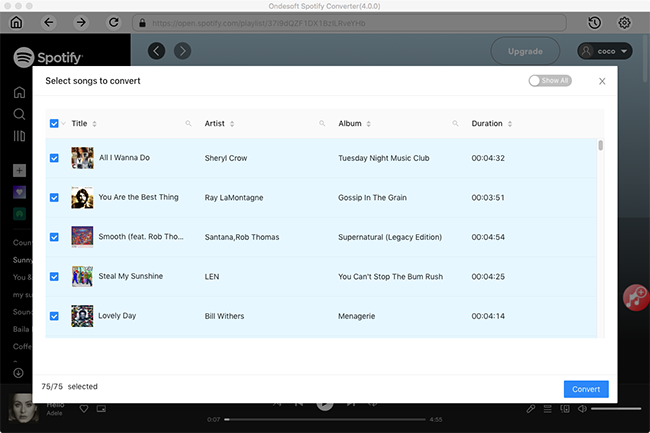 Click the Add button, then drag&drop the album to the converter from Spotify app directly. Or copy&paste the link of the album to the bottom search box and then click the Add button. The default output format is MP3. If you want to select other output format:M4A, WAV and FLAC, click Option - Advanced. You can also change bitrate, samplerate according to your needs. Click Option - General to change output format if you need. Click the Convert button to start converting Drake’s Views to MP3. After conversion, click the History button and the folder icon, then you can find all converted songs. Now you can transfer and play Drake’s Views in MP3 format on any devices.